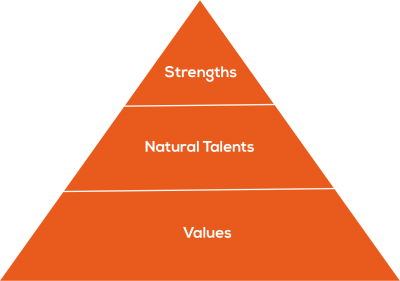 Strengths sit on a foundation of values. Think of it like a pyramid with values at the bottom. Your values express your deepest held beliefs. They reflect what's most important in life. In the middle of the pyramid, you have your natural talents. These are your default patterns that show up in how you think, feel, and act. Your strengths sit at the top. These are your talents in a well-developed form - so well that they repeatedly lead you to near perfect performance when you apply them. 1. Don't make me pick from this list of awesome words. I like all of these things.2. Don't ask me to admit aloud what I value most. What if people judge me because I pick something like "aesthetics" over a word like "family"? 3. Why should I do this? Do my values matter when my job responsibilities are dictated by the company, not by my soul? Those are valid things running through your head. Yet it's important to be clear on your values because if they get insulted or squashed down at work, you'll feel burnout, discouragement, and lack of trust at a much higher rate. Instructions: This exercise is really practical if you apply it to a situation at work. For example, imagine a time when you felt most in flow. Think of the culture, the team, and the role. Now, circle for the values it supported. For example, you worked on a quality assurance team with top notch peers. The nature of the work and the high quality team members allowed you to live out your values of "Excellence" and "Accuracy" every day. Then imagine a time when you struggled at work. It may have been a relationship, a team culture, or a situation that made you uncomfortable. Now circle the values that may have been insulted. For example, if "Independence" is your highest value and you work on a highly collaborative team with shared accountability, it may insult your guiding principles in life because you need more personal control to feel at your best. Do The Words Seem Too Similar? We included words that may seem like synonyms because certain words carry a charge for different people. If you feel like several words cover one sentiment, you can group them and pick one word to represent that category of values. 1. When were your values most honored on the job? 2. When people ask you "what's your Why," what is your answer? How does it tie into your values? 3. When were your values insulted or squashed on the job? How did that impact your desire or ability to show up at your very best? 4. What could you do this year to integrate your values with your work? 5. [Team Question] When you feel out of integrity with your values, how does that show up on you? How will your colleagues know? Did you think of a Value not on this list? Submit to lisa@[thisdomainname] with the subject line "Add To Values Inventory" and we'll get it in the queue for consideration. Thanks for paying it forward to the next person who uses this crowdsourced list. You might also find the resources page helpful for Team and Leader tools. They're all designed to support a strengths-focused team.